At first blush, Korea has much to celebrate. Flagship airport Seoul Incheon International saw a 9.7% increase in 2014 passenger numbers, well above the country's 3% GDP growth rate. Visitor arrivals increased 17%, continuing a streak of near double digit annual growth. These are accomplishments, but Seoul Incheon is worried about falling transit traffic: after over a decade of transit growth, 2014 saw a half million decrease in transit passengers. The share of transit passengers fell to 16% from a high of 18% in 2009. Driving this is a confluence of events: the "Korean Wave" means Korean Air and Asiana are carrying more point-to-point passengers, traffic rights with key source markets have not been expanded, and once-sleepy Asian airline and airport peers are waking up and taking back the traffic Incheon has attracted. Long-haul growth is occurring out of Beijing, Tokyo, Hong Kong and Taipei. Incheon wants to have 10 million transit passengers in 2017 and is looking for new opportunities, but so far these plans are vague. Incheon may follow Singapore Changi's move to target LCC connections, which Kuala Lumpur has excelled at. Yet Korea's regulator is overlooking the queue of airlines – from Singapore Airlines to Emirates – that have been asking for more traffic rights. Protecting the nation's flag carriers may come with a price. Incheon in 2014 crossed the 45 million passenger mark, with a throughput of 45.5 million passengers, a 9.7% increase over 2013 when Incheon surpassed 40 million, with 41.4 million passengers. 2014's growth of 9.7% was faster than 2013's 6.4%. Over the last decade Incheon has generally achieved annual growth of 5-10%, with the exception of 4-5% contractions in 2008 and 2009 (which were followed by 17% growth in 2010). Seoul Incheon is the gateway to Korea. Of Incheon's 45.5 million passengers in 2014, 44.9 million were international passengers. Busan in 2014 carried 4.9 million international passengers, Seoul Gimpo 4.1 million and Jeju 2.3 million. Note: Incheon opened in Mar-2001. Growth rates calculated from 2003. Despite an increase of 4 million passengers between 2013 and 2014, Incheon's transit traffic declined by 460,000 passengers. Incheon's share of transit passengers declined from 18.5% in 2013 to 15.9% in 2014. 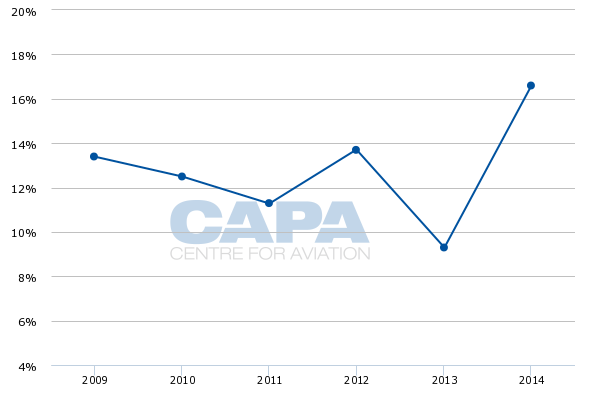 The 2013 share of 18.5% was a record since the airport opened in Mar-2001. (Transit figures are unavailable for 2002 and 2003 but are unlikely to be higher than 18.5% since 2001 had a 11.1% transit share and 2004 12.1%). Incheon attributed the decline to greater competition from Chinese and Japanese hubs for long-haul flights. Note: Incheon opened in Mar-2001. The 15.9% transit figure is Incheon's fifth highest but erases market share gains made since the start of the decade. After an 11-12% transit share between 2001 and 2007, Incheon started growing transit traffic share: to 14.5% in 2008 and 18.2% in 2009 before falling to 15.5% in 2010 and then rebuilding. In terms of transit passengers (and not share), 2014's decline of half a million was Incheon's second. 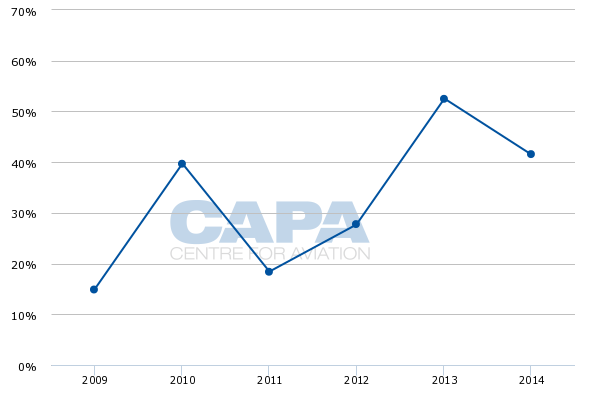 Its first decline, in 2010, was only 7,000 passengers and occurred during a downturn. This makes the 2014 decline far more serious than in 2010. Even with the decline, however, Incheon had more transit passengers than in any year besides 2013. Incheon's most recent stated goal was to have 10 million transit passengers in 2017. So the issue is not Incheon suffering a decrease in passengers but rather a change in the mix of passengers. 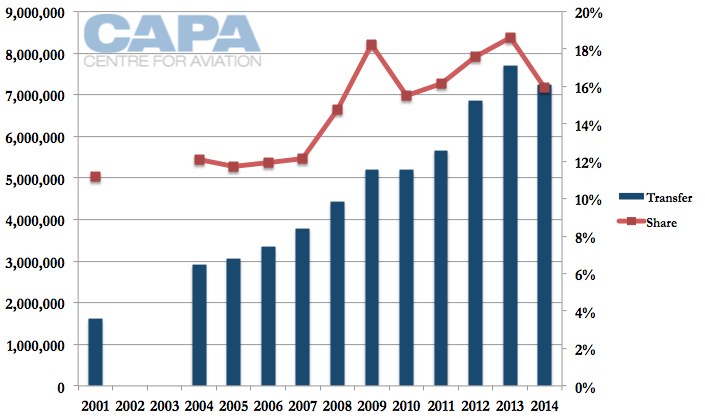 In recent years, 2014's overall passenger growth of 9.7% was surpassed only by 17.2% in 2010 (which as noted earlier followed declines in 2008 and 2009) and then 11.1% growth in 2012. Part of Incheon's challenge is the growing demand for Korea as a destination, particularly from China. Previously Korean Air and Asiana might have transported a passenger from China to North America via Seoul. But now Korean Air and Asiana can attain better yields on China-Seoul point-to-point traffic, so much so that offering a connection to North America would require the Seoul-North America flight to be sold below cost. Korean Air and Asiana cannot grow capacity significantly in China to maintain transfer traffic levels. This is because the China-Korea bilateral remains constrained. There is "open skies", but only to China's Shandong and Hainan provinces, which are leisure locales. 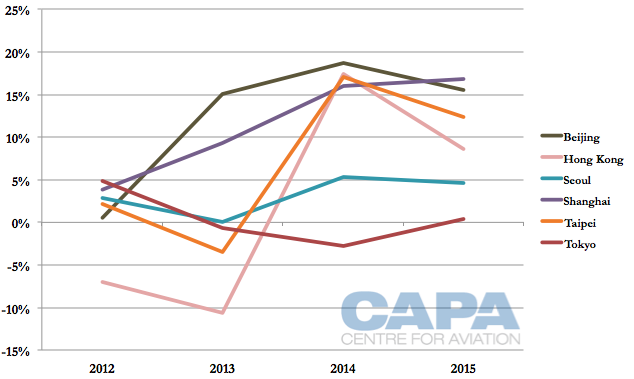 A 2014 bilateral increase saw Korean carriers gain some rights, but well below hoped for levels. Further, China has clamped down on "charter flights", which Korean carriers effectively used for regularly scheduled flights. Korean carriers are logically opting for higher-yielding China-Korea point-to-point traffic (as well as other regional point-to-point markets) rather than transit traffic. Korea's visitor numbers have doubled in six years from 6.9 million in 2008 to 14.2 million in 2014. Except for a 9.3% growth rate in 2009, growth has been in the double digits including a staggering 53% in 2013 and 42% in 2014. By contrast, it was only in 2013 that Japan – with a far larger size than Korea – passed the 10 million visitor mark. 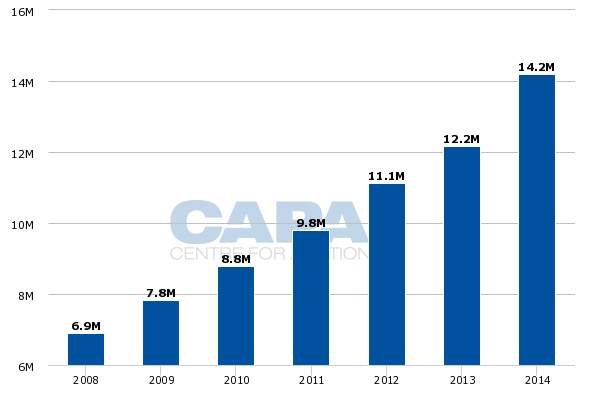 Chinese visitor growth to Korea has been at or above 20% in recent years. Another factor for Incheon's declining transit traffic is that its main transit traffic markets – North America between North and Southeast Asia, and Japan to Europe – are becoming more competitive. 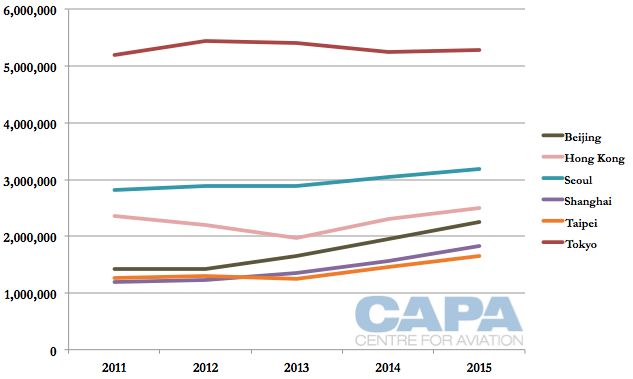 Growth is especially evident in North America flights to Beijing, Shanghai and Taipei. Beijing grew 15% in 2013 and 2014 and is expected to continue that rate in 2015. Shanghai saw 15% North American growth in 2014 and will also continue that in 2015. Tokyo shows flat performance while Hong Kong has rebounded to previous levels. However, these figures do not show the full picture as the local carriers in those hubs – ANA and JAL in Tokyo and Cathay Pacific in Hong Kong – have been growing while foreign carriers (such as Delta in Tokyo) have been decreasing. The local carriers can take advantage of their onward Asian markets (which North American carriers cannot fully do). Further, Asian passengers may prefer to fly with an Asian airline, perceived to be more comfortable than a North American carrier. Transit traffic flows are larger in the Asia-North America direction than North America-Asia. One notable Korea-North America growth development in 2015 will be Asiana replacing its 777-200 on Seoul Incheon-New York JFK with an A380, increasing capacity. Seoul was able to maximise other hubs' weakness, but now they are seeking to claw back their local traffic and generate transit traffic. A Beijing official said in early 2015 that international transit passengers accounted for 17% of inbound foreigners into Beijing Capital with daily transit passengers exceeding 7,000 during the peak season. Beijing Capital's 17% share is similar to Incheon's, but Beijing's figure is only for inbound foreigners. Only a quarter of Beijing's capacity in Feb-2015 is for the international market, and the outbound market is larger than the inbound market. Nonetheless, the figure already has meat and shows potential for growth as Air China tunes connecting schedules, reduces minimum connection times and looks forward to the planned 2017 opening of the new Beijing airport with greater capacity. Beijing's countdown is also Seoul's. 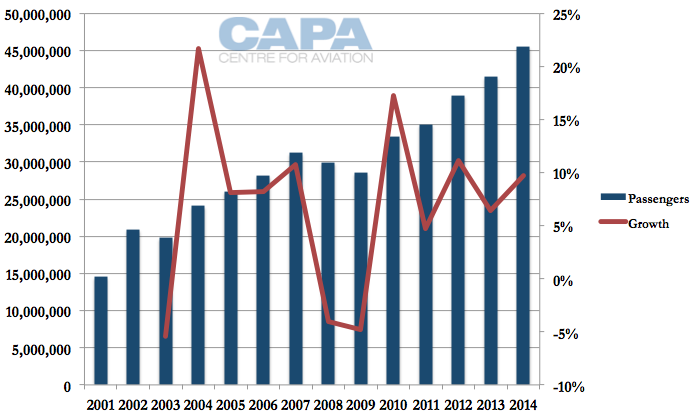 China's regulators have been very aware of Incheon benefitting from Chinese airports' weakness. Other foreign airlines have even used Incheon in their bargaining: allow us, the smaller player, more traffic rights or see Incheon, your bigger competitor, further grow. Transit traffic is growing elsewhere in North Asia. ANA's fastest type of growth (but from a low base) is transit traffic (trilateral on the graph below) while Southeast Asian connections comprise half of EVA's North American traffic. Both carriers, and others, plan more North American growth. Note: Dark blue is passengers to/from Narita, light blue is passengers to/from Haneda. In the smaller Japan-Europe market, Korean carriers have benefitted from having a single hub allowing connections from Europe to smaller Japanese points (Korean Air serves 13 Japanese airports). ANA and JAL had relied on long-haul flights going to/from Tokyo Narita and domestic connections from Tokyo Haneda. This required transferring airports, creating a split airport system that was not convenient. But now that long-haul flights from Haneda are growing, ANA and JAL's proposition becomes more attractive. Japan-Europe capacity has been flat, but Japanese carriers have been growing while European airlines have reduced capacity. For Japanese customers, their preferred home airline now has more seats to Europe and an easier transfer process. Korea has so far punched above its weight in North America-Southeast Asia transit traffic. But its northern geography inherently limits access to smaller Southeast Asian destinations on narrowbody aircraft (which would not have the range) or using smaller aircraft on lower-demand frequencies. Asiana and Korean Air will each serve 16 Southeast Asian destinations in Mar-2015, only three less than Cathay Pacific and Dragonair, the North Asian leader with 19. But frequency will be less than half of Cathay. Chinese airlines are growing: Air China from Beijing serves eight Southeast Asian destinations and China Eastern (with Shanghai Airlines) 11 from Shanghai. In Taiwan, China Airlines and EVA serve 11 and 10 destinations respectively but China Airlines has almost as many frequencies as Asiana. Incheon officials met with Delta Air Lines CEO Richard Anderson in Dec-2014 to discuss moving Delta's (decreasing) Asian gateway from Tokyo Narita to Seoul Incheon. Delta has beyond rights from Tokyo (inherited from its merger with Northwest) that means that Delta contributes heavily to Tokyo's transit rate. Delta has also explored the possibility of a JV with Korean Air. In the past Incheon has cut passenger safety inspection charges for transit passengers. Korea's transport ministry, Incheon airport, Korean Air and Asiana Airlines also launched a task force in late 2014 to find ways to maintain and increase the number of transfer passengers, according to The Korea Times. 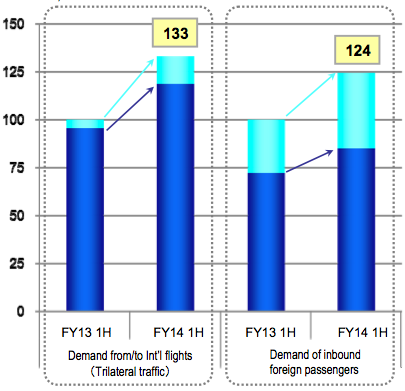 Incheon's annual report also mentions growing links between full service and low-cost airlines to drive transit growth. LCC Jeju Air has also spoken of its wish to have a role in transit traffic. On the eve of opening KLIA's new low cost terminal, AirAsia X is rapidly growing its connecting traffic as the medium/long-haul low-cost carrier thickens its schedule and builds out its network. Transit traffic accounted for 43% of AirAsia X total passenger traffic in 2013, up from only 25% in 2011. AirAsia X expects this figure to approach 50% in 2014. The growth in transit traffic has huge implications for the AirAsia Group and its main hub, KLIA. There are also implications for other Asian carriers and hubs as AirAsia starts to compete on city pairs that previously did not have any LCC options. The gains in transit traffic at KLIA, which has recorded the fastest passenger growth over the last 15 months among Asia’s major airports, come at the expense of rival hubs. For example, neighbouring Singapore Changi has seen growth moderate significantly and risks a further slowdown unless it can attract a surge from the emerging LCC transit sector. The recent growth spurt at KLIA and the success the airport has had at increasing LCC transit traffic should serve as a wake up call for Singapore and Changi. 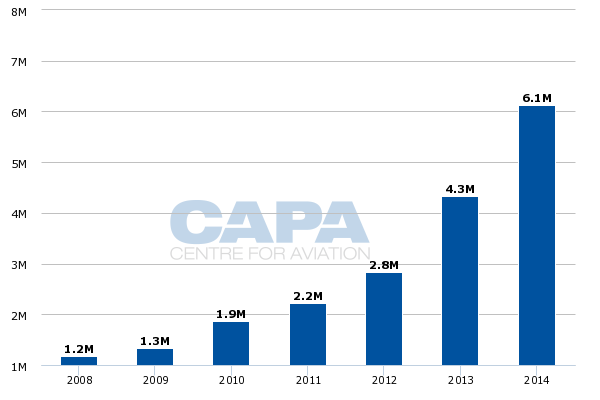 While KLIA traffic has been growing at a rate approaching 20%, traffic at Changi grew by only 5% in 2013 and by only 1% in 1Q2014. More LCC transit traffic could unlock a new period of growth for Singapore. But if Changi does not succeed at attracting this new segment traffic will likely grow in the low single digits over the short to medium term. While AirAsia has steadily grown its transit traffic, Scoot and Tigerair currently see an extremely low volume of transfer traffic. The two carriers began offering joint itineraries over one year ago but the partnership has not yet generated significant traffic. Approval in their pending application with Singapore competition authorities for permission to discuss coordinating schedules could help but Scoot and Tigerair will still need to take the initiative and implement a stronger partnership. Jetstar has had more success with transit traffic in Singapore, with at least 15% of the group’s passengers at Changi transiting. But Jetstar has cut back its long-haul operation at Singapore to just one route and also has stopped pursuing growth of its Singapore-based short-haul operation, limiting transit traffic growth opportunities. If Scoot and Tigerair were able to follow the AirAsia X/AirAsia model in pursuing transit traffic, Changi could easily see a double-digit increase in LCC traffic without having to rely on its increasingly mature local short-haul LCC sector. For now the numbers may not seem huge – the 1.4 million transit passengers AirAsia X recorded in 2013 represents only 3% of KLIA’s total traffic. But the growth opportunities and implications in the emerging medium/long-haul LCC transit sector are staggering. See related report: AirAsia X drives 43% transit traffic at Kuala Lumpur's KLIA. Can Singapore follow the same recipe? Like any airport, Incheon would like to have the best of all worlds by growing both transit and O&D passengers. But market dynamics outside Incheon's control are effectively forcing the airport and local airlines to choose between them. For Korea as a whole, O&D passengers are a better value option. Visitors bring a far larger economic contribution than transit passengers. Other airports, like Singapore Changi, do not have the luxury of choosing between O&D and transit traffic; local demand is saturated. But that is far from the case in Korea. Other hubs will continue to pressure Incheon's transit traffic, but Incheon, either with a changed regulatory view from Seoul or by giving incentives, should be able to grow transit traffic, even if it is perhaps a narrow agenda to pursue. Still, the hub concept persists. Arguably a hub status insulates an airport if one O&D traffic stream weakens – perhaps a political matter in China, or economic weakness in the US. Far-sighted but uncertain initiatives could boost Incheon's transit traffic: a Delta Air Lines hub (although Delta is moving towards non-stops rather than relying on its Tokyo Narita hub) or LCC connections. But the LCC market in Korea is far smaller and faces more challenges than in Southeast Asia. Many of the LCC challenges in Korea are from the legacy airlines and government. Incheon-based Jeju Air is playing along, referencing its desire to develop connections, even with other airlines. If Incheon wants meaningful LCC connections, it will need to convince powers greater than the LCCs themselves. And even then, the opportunities may be lower than in Southeast Asia, where flag carriers (and protectionist views) are not as influential as in North Asia. Korea in the past has worked hard to block initiatives that could now be very handy to grow transit traffic. One of Changi's transit initiatives is being realised with a codeshare between Emirates and Jetstar Asia (Jetstar Asia partners, including via interline, with other carriers too). In Korea, Gulf carriers do not have enough capacity yet to contemplate sending some on for connections. Further, Korea's LCCs may not have the IT infrastructure to handle international connections, even if they want to. A foreign LCC like Jetstar or AirAsia with a proven track record of connecting traffic could help, but Korea rejected the proposed Tiger Incheon and a more recent proposal from AirAsia for an AirAsia Korea unit. In seeking more traffic, Incheon is ignoring the low-hanging fruit. Korea has had a queue of airlines – including Emirates and Singapore Airlines – waiting for years for more traffic rights. Some put Korea in the same protectionist basket as India as far as aeropolitical matters are concerned. Japan has been willing to look past the interests of its airlines in granting Gulf carriers more access. If Korea did the same, it could probably gain an additional million passengers from Gulf airlines in two years, double the number of transit passengers Incheon lost in 2014. Singapore Airlines and its wholly-owned subsidiary Scoot could further contribute, to name only two markets. The difference of course is that Emirates and Singapore Airlines are not Korean carriers, and Korea hopes transit traffic will be carried by Korean carriers. SIA would like to up-gauge its Singapore-Seoul Incheon-San Francisco service from a 777-300ER to A380, which would boost Incheon's transit figures, but Korea is unwilling to grant the right. Some bilaterals stipulate how much local traffic can be carried on fifth freedom sectors. Korea could use this to limit SIA's impact on Asiana and Korean Air's Seoul-North American network, but Korea would prefer its airlines to carry the traffic from Singapore (or elsewhere) to North America via Incheon. This is a classic divide of airport versus regulator. Incheon sees itself being impacted by factors outside its borders yet regulators are mostly looking internally for a solution. Does this haystack even have a needle to find?